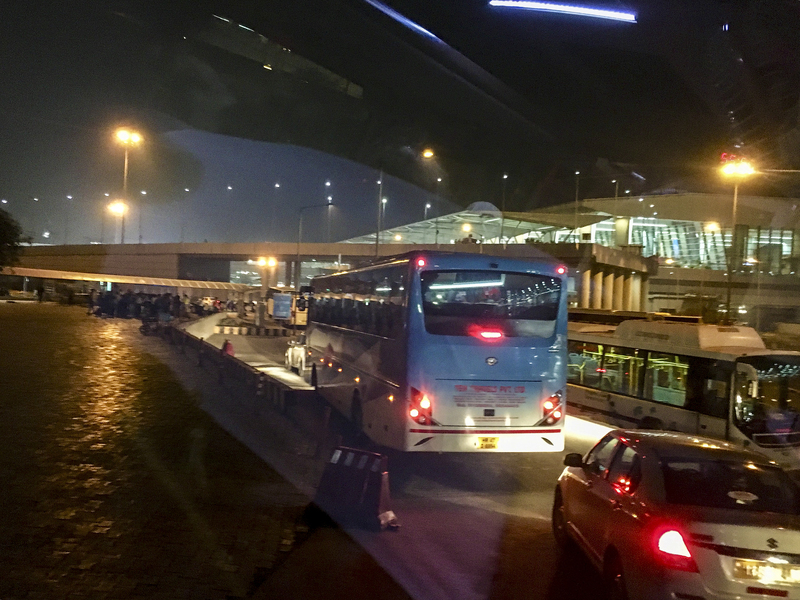 Leaving Delhi Airport at about 10pm, we were about to leave the experience of international jet travel to spend 8 days travelling by a variety of transport modes, ancient and modern. Here a bus, shot through the windscreen of our bus, is about to tackle Delhi in the 1 hour trip to our hotel . 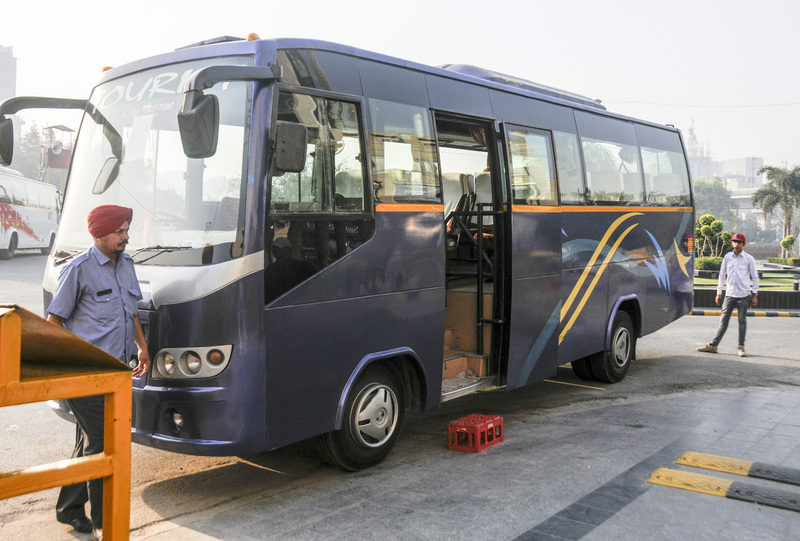 Speaking of buses, here’s a transport, a small bus, air-conditioned and with a driver and bus boy. We are about to leave a modern hotel and drive through the streets of Delhi, Jaipur and Agra. A different world for 10 tourists from Australia. India has more motorbikes than any other country (37,000,000) and most of them are produced locally. They are mostly low engine capacity but that does not reduce the passenger load. We regularly saw 4 passengers, 2 parents and 2 children.Helmets were rare. Julie asked our guide “why are Red Lights optional?” as we watched streams of traffic cross intersections against the lights, clogging up intersections. Arvind took the microphone, informing the bus that “Unfortunately in this country there is a lower value placed on human life than in yours. While we have laws they are rarely enforced”. 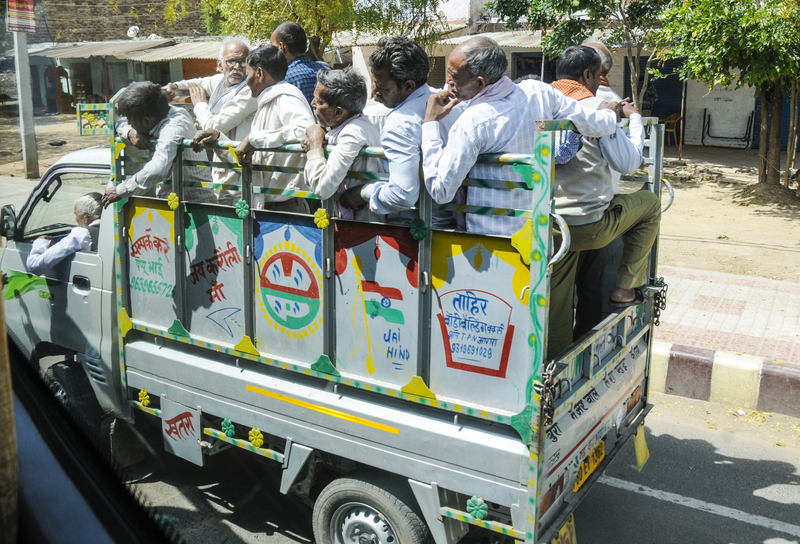 Who says trucks are for industrial use when you can use them for passengers as well. 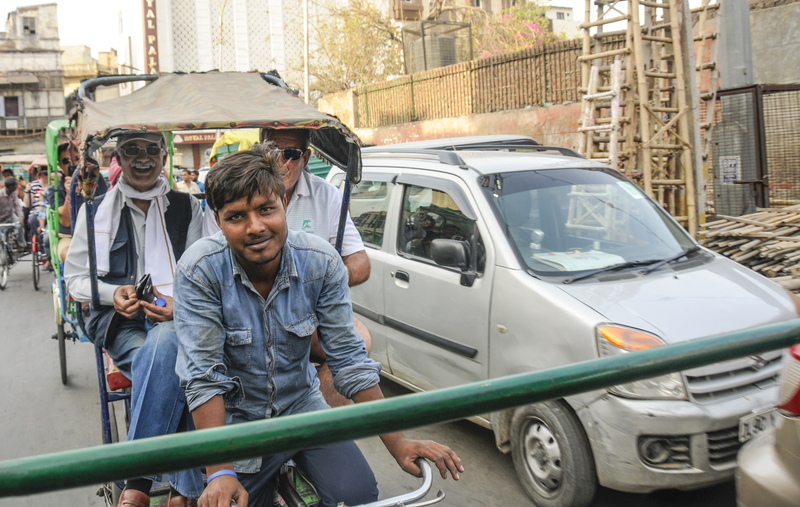 Our rickshaw ride through the back streets and lanes of Delhi was exciting. 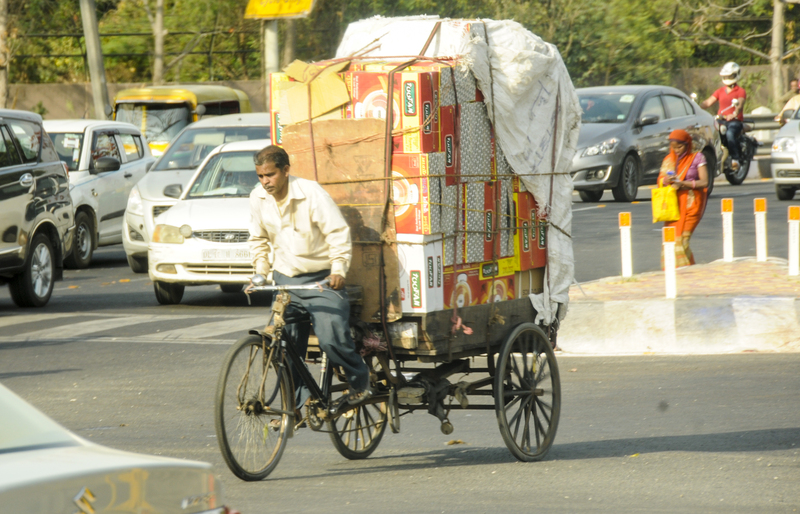 Bikes are used for carrying for carrying large loads. Heavy loads of building materials require help from pushers to get up the steeper streets. 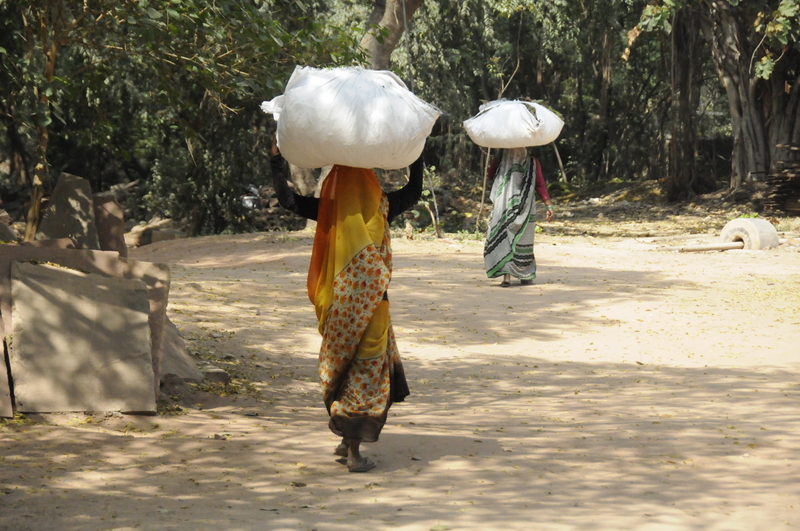 Labour is cheap in India, so deliveries on foot, with loads carried on the head are still seen in the biggest cities. Yes Julie and I had an elephant ride up the very steep slope to the Red Fort in Jaipur. For my friends concerned about animal abuse – there were several hundred elephants, who would otherwise be put down, several hundred drivers earning foreign currency and the elephants work a maximum of four hours a day with a rest break after 2 hours. 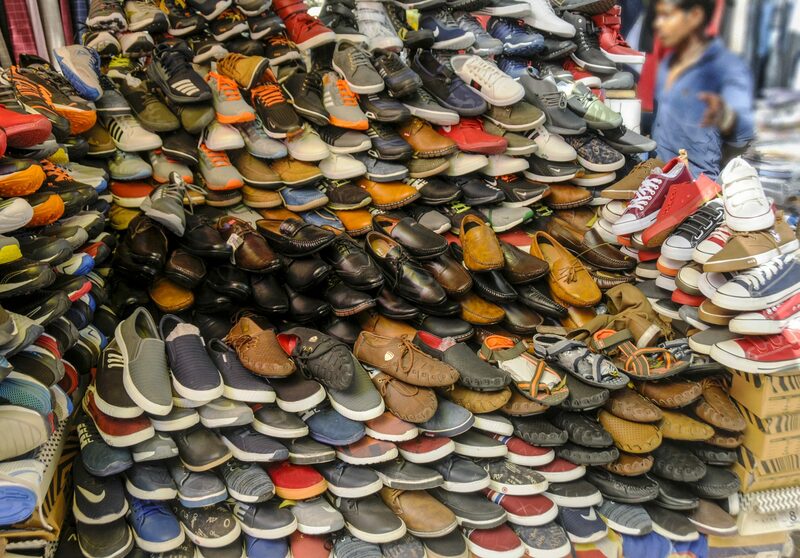 Our guide told us we were in India to support their economy! 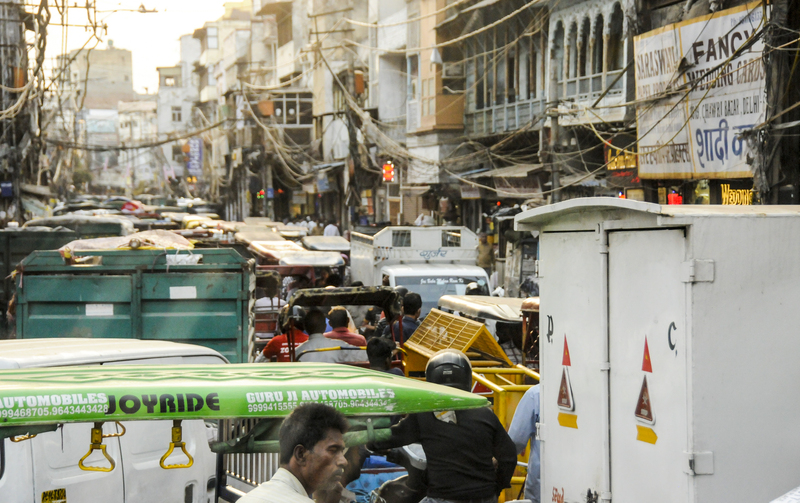 Traffic is chaotic in Old Delhi. Narrow roads, too much traffic, no one follows the rules. It took us an hour to travel half a km through this. 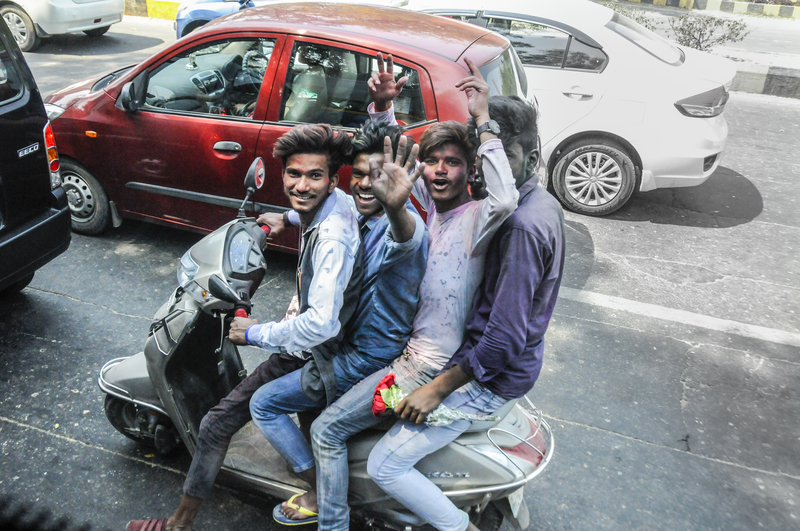 After the Festival of Holi (colours), these four up on a motor scooter were keen to show off the hues they had been pelted with in the morning. 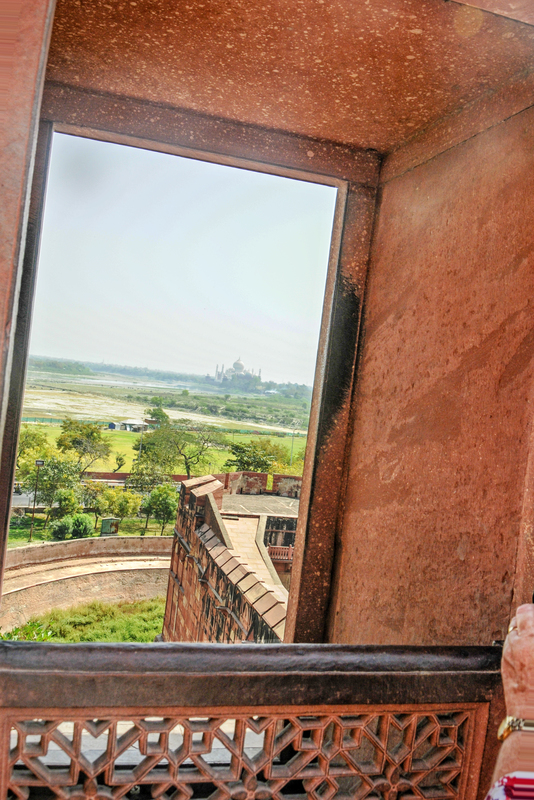 Arriving at our hotel in Agra the young porter said he had a surprise, dramatically throwing wide the curtains to reveal a recognisable spot on the smoggy horizon – the Taj Mahal. 5:30 am wakeup, 6am in the bus and at 6:30 the warmth of the sunrise rims the building Aldous Huxley described as ‘perhaps the most beautiful building in the world.’ It is listed as one of the Seven Wonders of the World. The Entrance gates facing down towards the tomb. In the right corner, is the bench where everyone gets photographed, to prove they have been here. Bill Clinton once said, `There are two kinds of people in the world. Those who have seen the Taj Mahal and love it and those who have not seen the Taj and love it.’ I hope with my photos and words I can help you agree with a President of the USA on a least one thing. 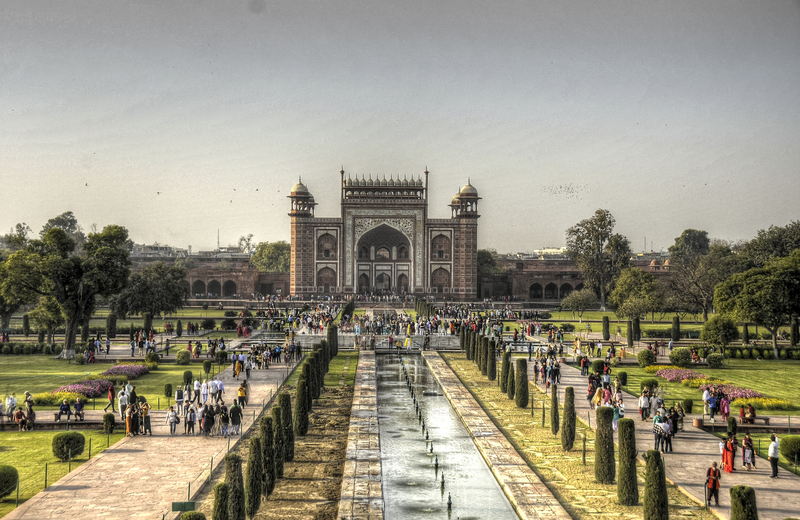 This place is all about symmetry – laid out in a rectangular grid, 42 acres with water fountains and gardens and reflecting pools along the Yamuna River, including a mosque, a guest house, an enormous entrance gate, four minaret towers and the tomb of Mumtaz Mahal, Shah Jahan’s wife. It has been described as “the soul of Iran incarnate in the body of India” because a Mughal (Muslim) despot, ruling a Hindu nation, used a Persian architect and local materials, to construct an edifice designed to last forever. 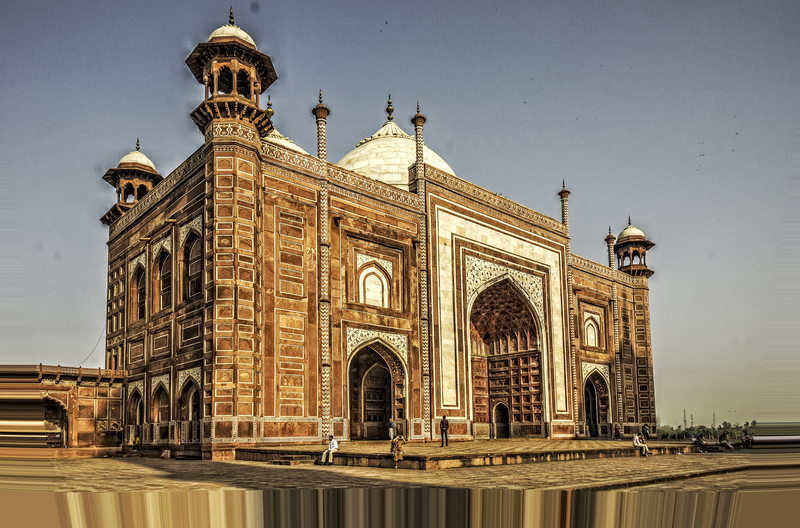 The Tomb is three stories on a raised plinth so it is visible from everywhere in Agra. This is the second floor entry to the crypt which required a full security search, because of threats made by terrorists to blow up the monument. The only lighting inside comes from the high windows on the four facing walls. 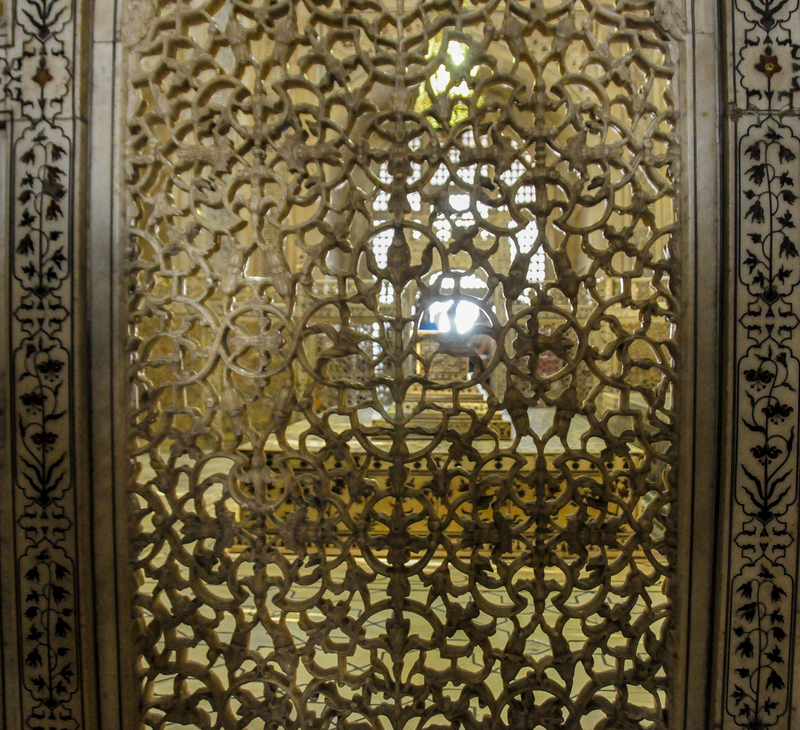 They are covered by ornately decorated, carved marble screens. Photography is forbidden within the tomb for practical rather than religious reasons. Taking photos slows things down and the single file of tourists has to be kept moving. The lack of light means that amateurs will let off flashes (horrible!) and professionals will want to use a tripod! I set the camera on 3200 ISO Automatic exposure, lens wide open and put it down on any solid surface, taking a time exposure. Nobody noticed I took 8 images, 4 of which were usable . The pictures are much brighter than reality-the equivalent of a bright moonlit night. 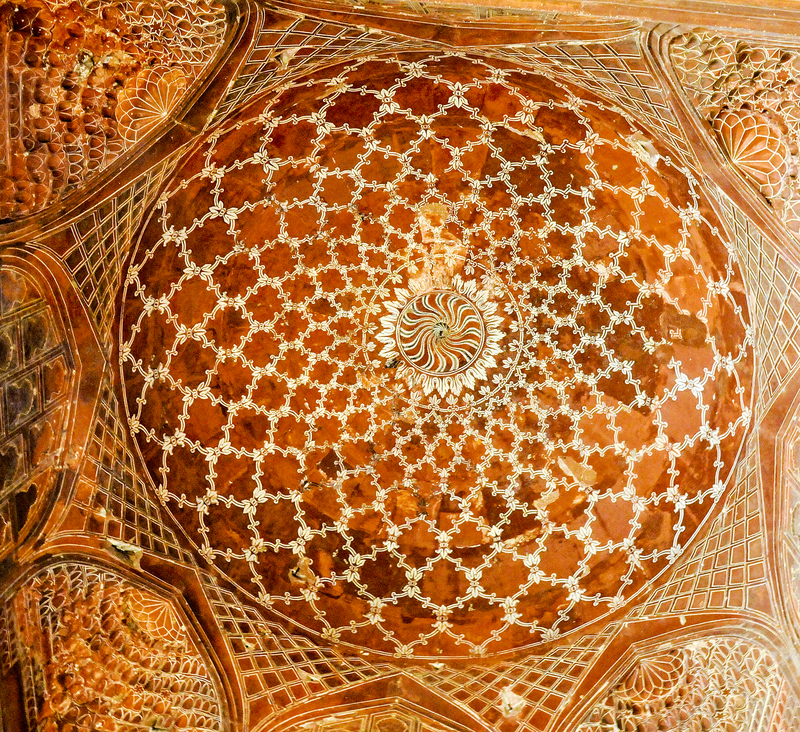 In the centre of the crypt is the casket of Mumtaz Mahal, the Empress Consort of Shah Jahan, Mogul Emperor. Her remains are not in the casket but in the crypt underneath. She married at the age of 19 in 1612 the Prince who 11 years later became. Shah Jahan.. She was his second wife. Mumtaz and her husband had fourteen children. Mumtaz Mahal died in 1631 during the birth of her fourteenth child, a daughter who survived and lived to 75. Mumtaz was a talented and cultured lady, well-versed in Arabic and Persian and a poet, She was reputed to have a combination of modesty and candour, a woman warmly straightforward yet bemusedly self-possessed. Their’s was a passionate marriage. His other two marriages, in contrast were politically motivated and each only produced one child. 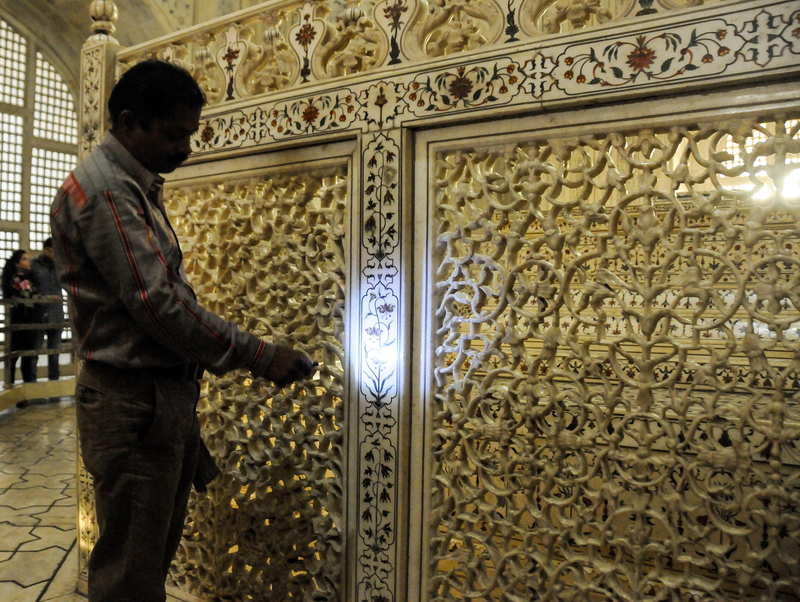 In the dark the security guard uses his torch to demonstrate the translucent marble of the screen and the luminance of the semi precious stones used for the decorations. 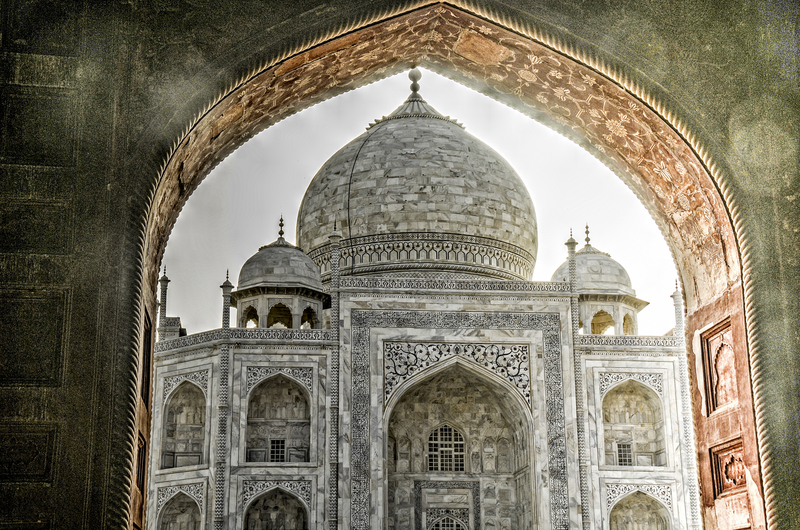 The Taj has been described as having been “designed by giants and finished by jewellers”. The Mosque. On the other side of the Taj is an identical building. It is not a mosque though. 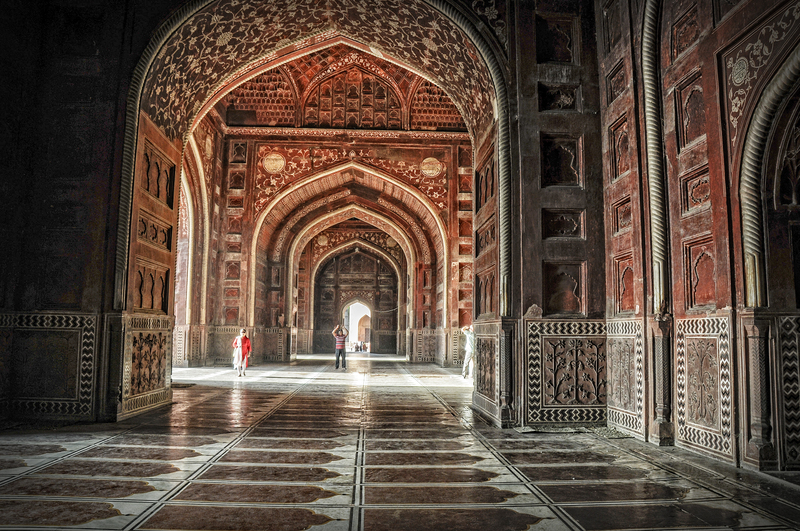 It was believed to be used as a guest house, but it purpose was to make the Taj Complex perfectly symetrical. 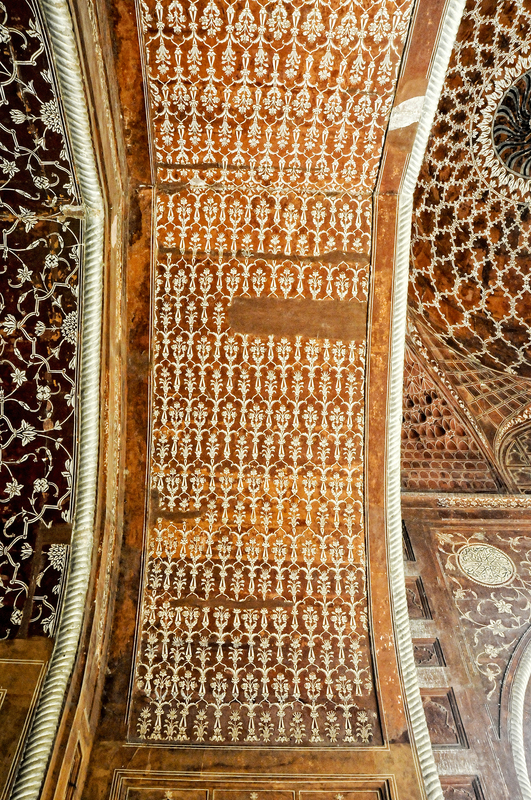 The outer porch of the mosque, magnificent arches, towering ceilings with jewel decorated panels. 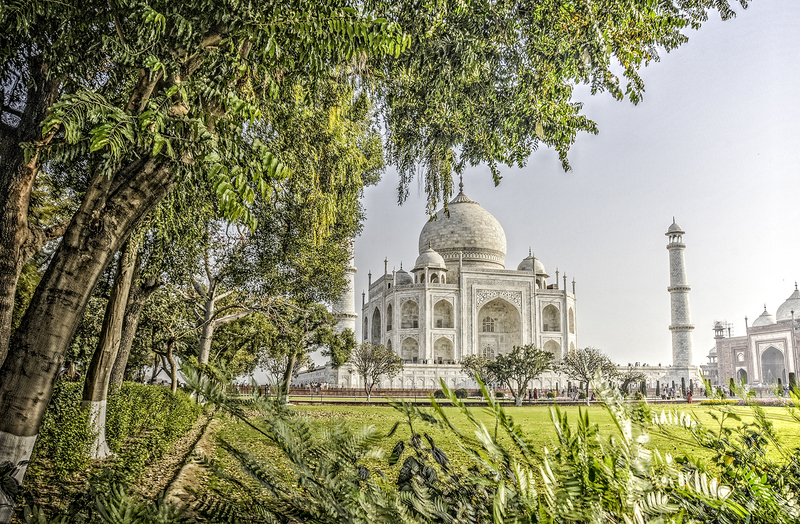 When the British conquered India and first saw the Taj Mahal these gardens were wooded with groves of many kinds of trees, especially fruits. They were cleared on orders of the British to give an unimpeded view of the magnificent buildings. 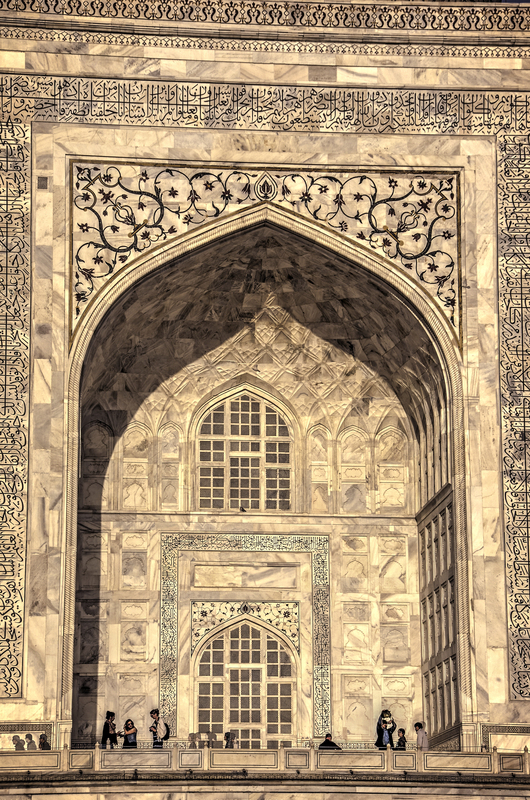 The Taj Mahal is a building built after tragedy and completed in conflict. The tradition amongst the Mughal Rajah’s was for the sons to fight amongst themselves for the throne. Mumtaz Mahal’s third son, Aurangzeb, ultimately succeeded his father as the sixth Mughal Emperor in 1658, having defeated (and executed) his three brothers. He then imprisoned his father Shah Jahan for eight years in the Agra Fort on the opposite side of river from the building where his wife lay. This was the view from his prison quarters. On his death he was buried beside her. This post is a portrait Gallery of the people who went on the trip, our leader and support staff and some on of the locals we met. Text will be confined to the captions under the images, which will tell you something of our trip. The crucial person on any tour is the Manager/Guide. In India we were fortunate in this being Arvind Sharma. His 30 years experience gave him a wealth of knowledge. Living in Jaipur made him a local. His passionate Indian nationalism made him an interesting leader for us all. His desire to learn about Australia was a bonus. We really appreciated the services of an excellent driver who deserved a medal for bravery who also helped out feeding the sacred cows. Our young Busboy, on his first trip, helped with luggage, handed out the water bottles regularly and even tried his hand out taking group photos. Danish spoke the local Hindi language having migrated to Australia 25 years ago so the Iman of the Mosque engaged him in animated conversation. Indians seem to be generally happy – smiles were common and wide. Our Rickshaw driver was leading the other four vehicles and proud of his pedal prowess. He was calling on his mates to catch up. When we “gatecrashed by invitation” a Hindu wedding, we did enjoy meeting the bride and groom but passed on the entrees. The new “Metro” is French designed but travels above ground level. Patrons are generally middle class with the poor living alongside the tracks. Sam is bartering for two custom made shirts to be made and delivered to our hotel that night while Peter and three shop assistants watched the bargaining process. While I took the photo, Julie bought a tablecloth. Many people asked us, before and after the trip “Why go to India?” and it’s a good question. People think of the massive population, overcrowding, poverty, noises and smells. 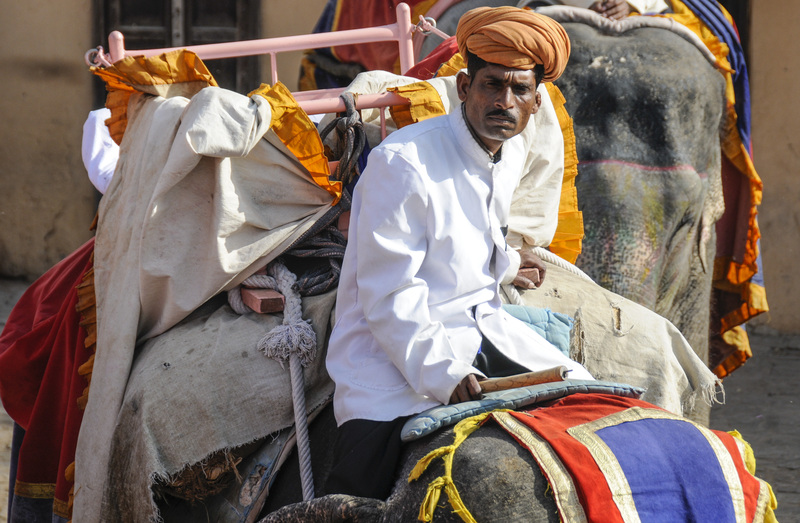 Several people however told us that visiting India, more than any other single country, is a life changing experience. We agree. 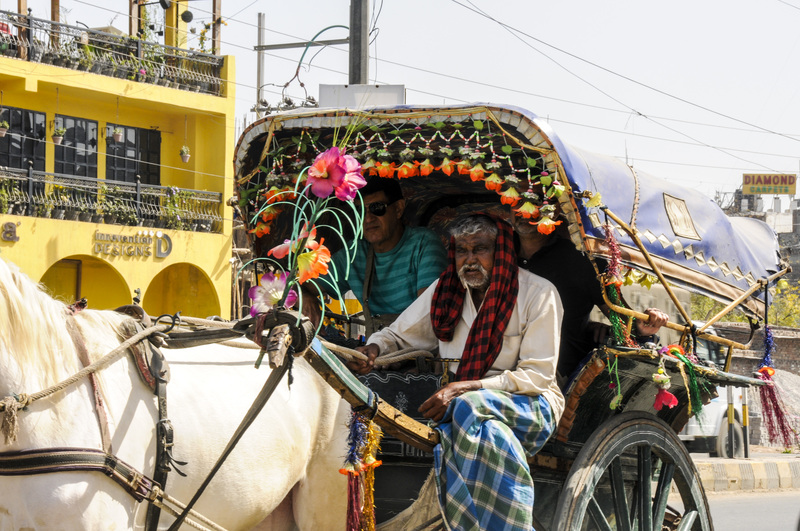 Julie and I travelled to India in March 2019 on Cathay Pacific and spent 8 days/6 Nights well looked after by SNA Tours. Traffic is chaotic. At one stage our bus took an hour to travel 100 metres. This photo was taken from our rickshaw, just before we turned into a lane not much wider than our vehicle, and just as crowded. We were all stuck together but those in the next vehicle were happy to see us. Road rage we never saw in India and, when I tried to explain the reaction that such situation provokes in Australia to our Tour Director, he just couldn’t believe it. Patience is important here. Arrival at a Hindu temple coincided with a wedding with hundreds of guests – the ceremony over and the feasting about to start. The mother of the groom invited us in, insisting on Danish being photographed with the bride and groom. Hospitality is important here. In Jaipur it was the Holi festival, which is all about spreading colour on everybody and everything in the morning, with quieter gatherings with family and friends to show off the colours later. They were keen to share the joy with our group. 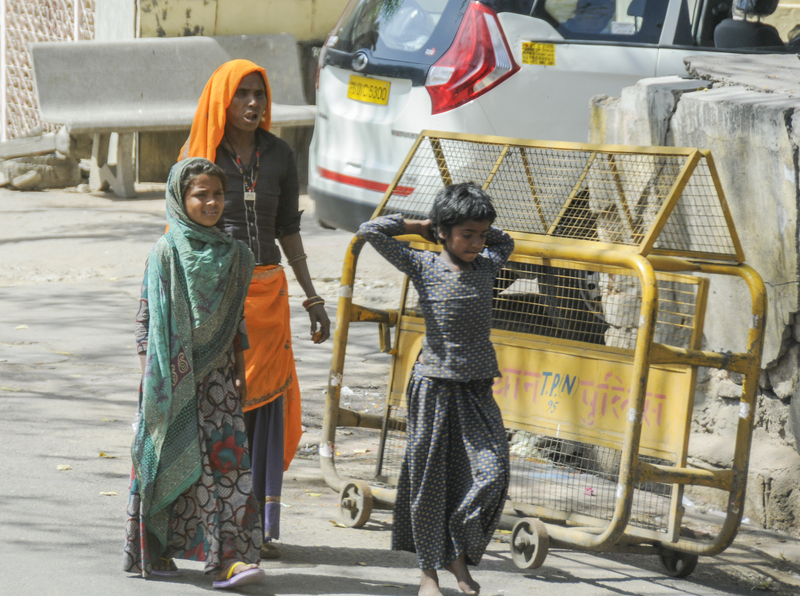 The population of India is 1.35 billion. In an area half the size of Australia. The capitol Delhi’s population is over 25 million and it is only the third biggest city. Everything in this country comes down to the people. What they have done in the past, are doing now and will do in the future is going to have a massive impact on our world in the future. This is the first in a series of posts I will make that illustrates my view that we learn when travelling is that ‘”People Make Places”. Please subscribe to see further posts and I love to see comments and sharing with others. Kings Park is an Icon for Perth. A short uphill walk from the CBD, it is an enormous space, mainly in its native state with panoramic views across the Swan River to the city. Julie and I spent a couple of hours with a volunteer guide walking through the ungardened section, looking at native plants growing au natural. These are some of the images I captured. All plants are local to the area. I received a comment about wild flowers. This year has been very wet in Western Australia, making for some magnificent displays, both in public gardens and in the wild. Flowers always incite me to photography, with the challenge to capture not only colour but pattern, texture and environment. In fact every sense except smell. So I am going to put up some floral posts. Some of these image have already appeared on Face Book, but this blog allows them to be displayed in a larger, better format. These first pictures come from the Araluen Gardens during their Tulip week. 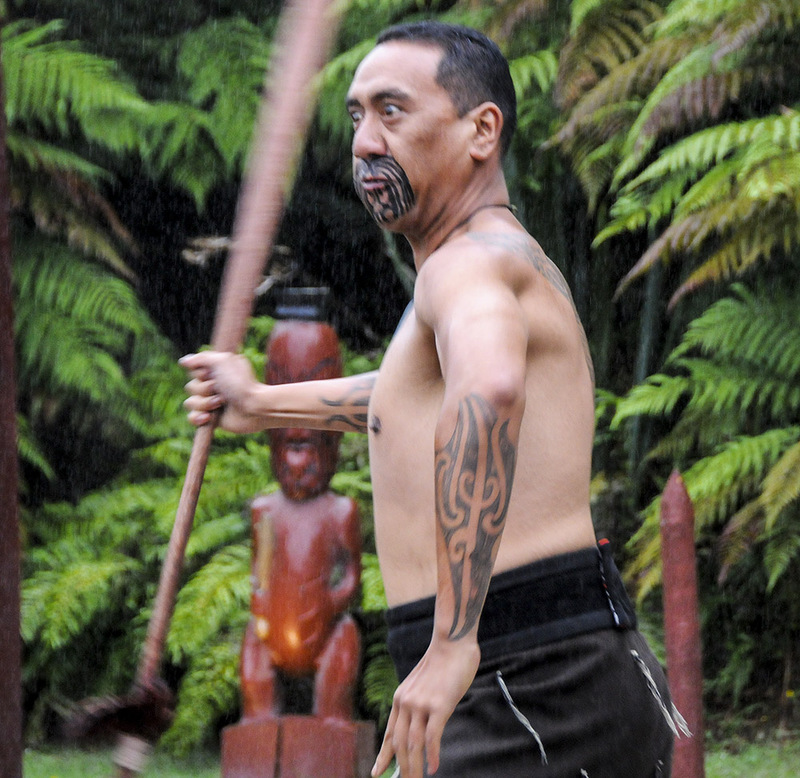 Of all the Pacifica Islanders of Polynesian descent, the Maori have been most successful in maintaining their pre European cultural traditions. 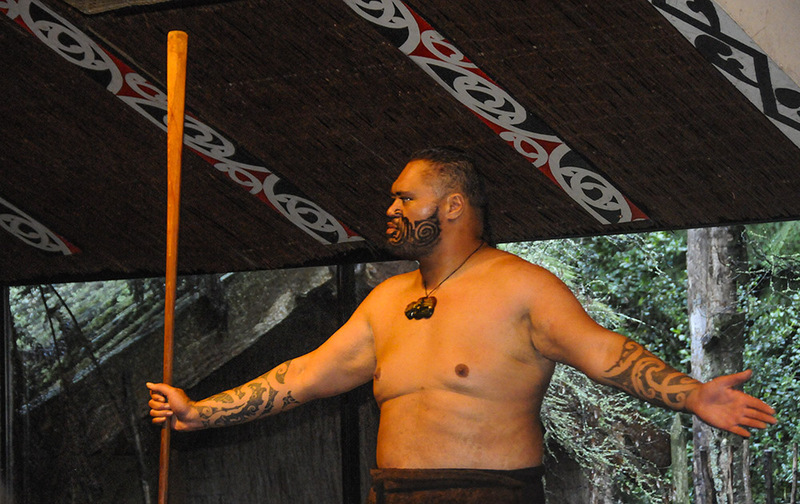 Within New Zealand, particularly in the North Island and areas like Rotorua Their clan structures remain strong, each with their Marae (communal or sacred place that serves religious and social purposes) and often including a Wharenui (Big House, Meeting House, Carved House) where we were greeted. Our bus driver/entertainer Cairo (not sure of the spelling but that was his pronunciation) appointed Ian as our Chief for the evening to represent us at the welcoming instructed him on the correct response to a peaceful welcome and then taught us all how to respond to our hosts with an enthusiastic Haere mai ! 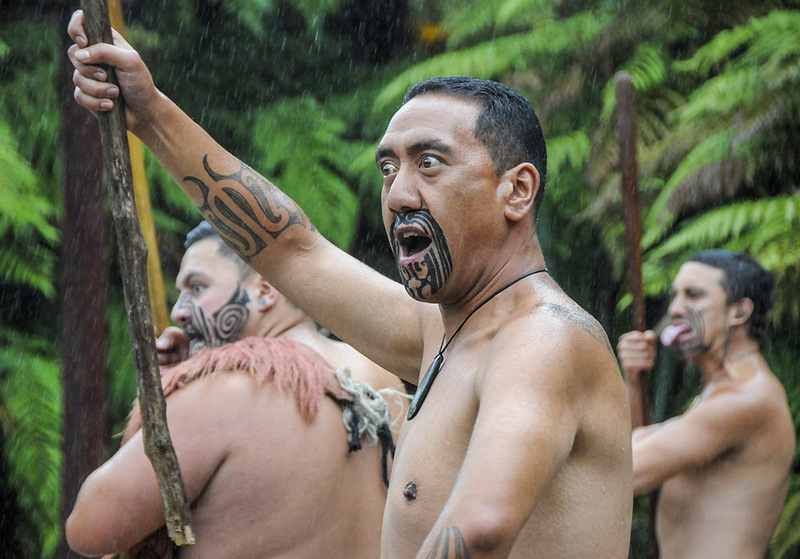 Anyone who has watched a NZ sporting team have seen the Haka performed. It is a traditional war cry/challenge very useful for preparing a team for competition, but is also commonly used for welcoming distinguished guests or for ceremonial occasions. 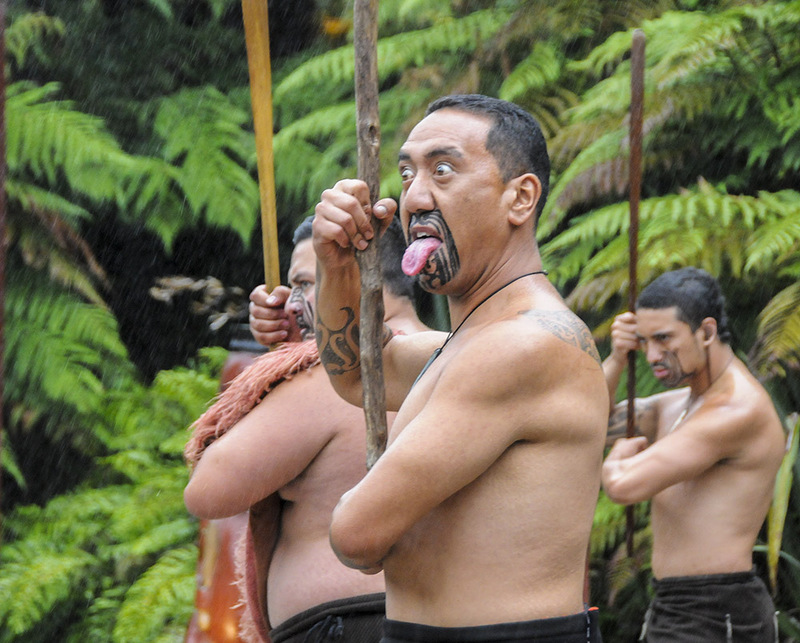 A very significant Haka was performed in 2012 by the 2nd and 1st Battalion Royal New Zealand Infantry Regiment performing a haka for fallen comrades who were recently killed in action in Afghanistan. 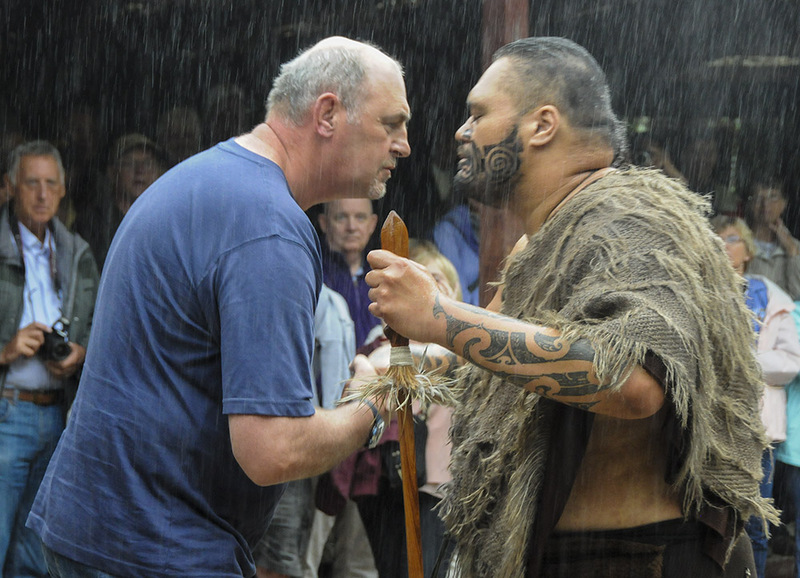 When visitors arrive at a Marae they are met by armed warriors who, with fierce facial expressions and grimaces, poking out of the tongue, eye bulging, grunts and cries, and the waving of weapons, impress on the visitors the strength of the clan. They then make a peace offering of a leafy branch. If the branch is picked up, the Clan Chieftain then greets the visiting Chiefs. 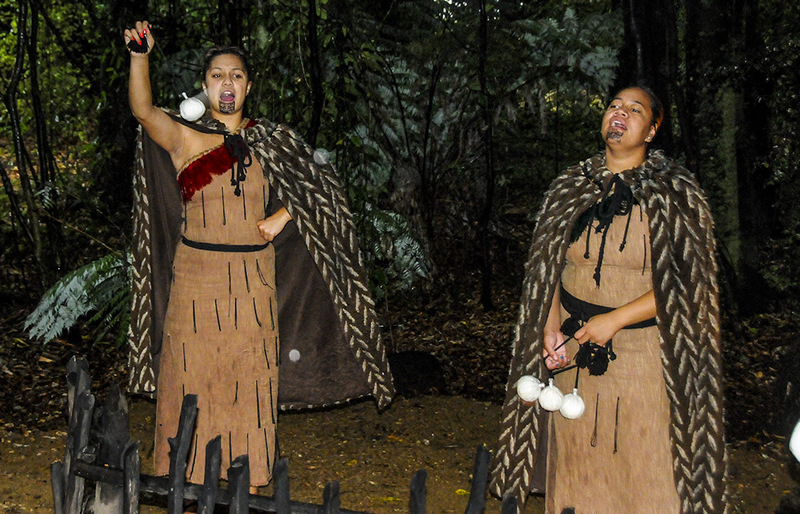 Poi, a performing art involving swinging weights in rhythmical, geometric patterns, with and accompaniment of singing and dancing. 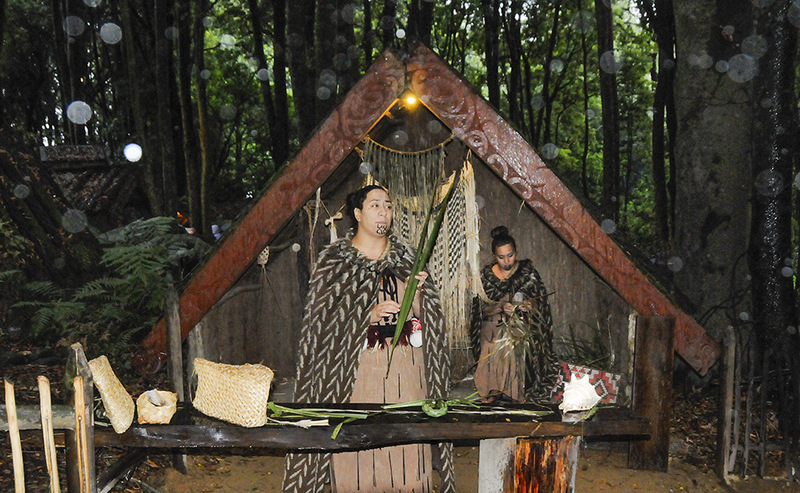 Weaving with flax produced garments like cloaks and kilts, shelter and useful things like mats. The woven patterns were used to pass on culture and stories. 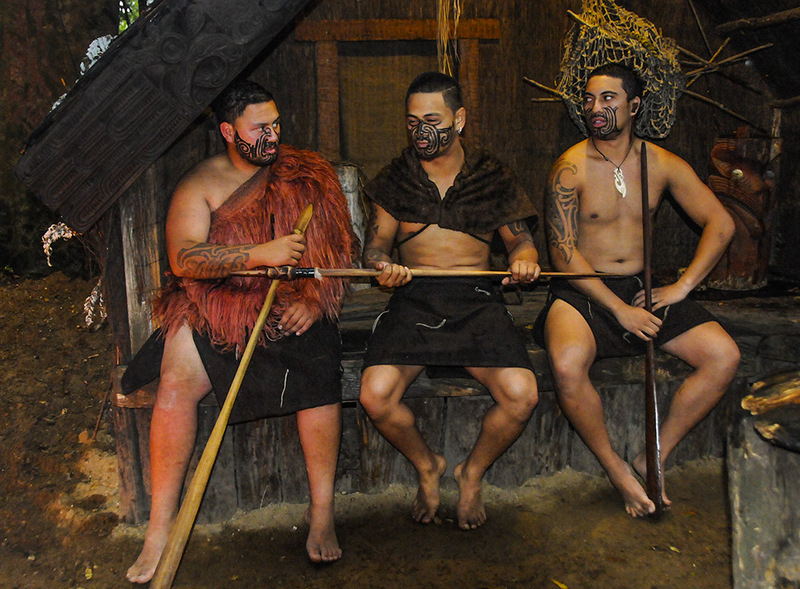 These young men explained the significance of carving and tattooing in their culture. The clan Chief invited us to a concert featuring both traditional and contemporary songs and dance. 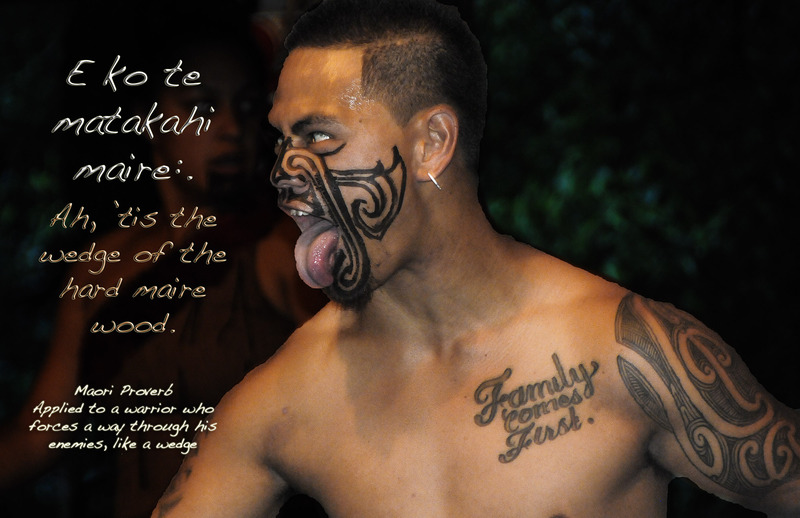 The tattoo “Family Comes First” seems incongruous on this amazingly ferocious expression! 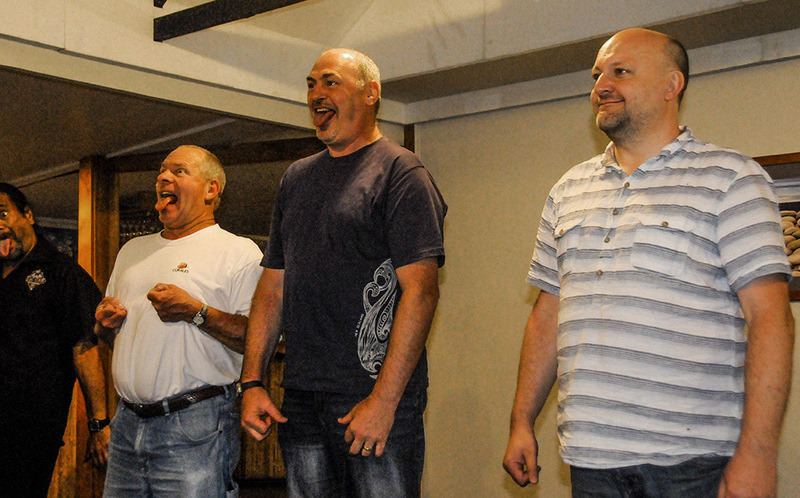 Our Chiefs did their best against some pretty fierce competition. The fact that all three Chiefs came from the Northern Hemisphere (two from England and one from the USA) probably put us at a disadvantage. 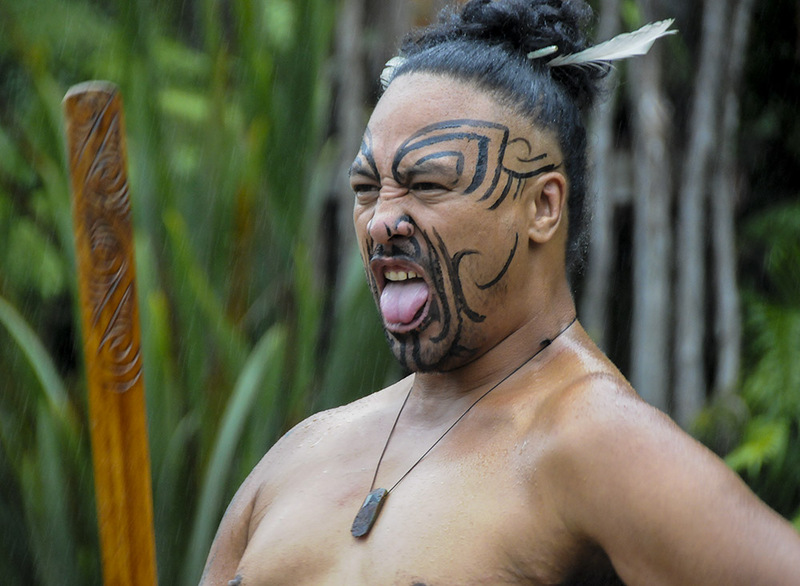 Our Maori brethren were pretty good at putting down any Aussies present, by the way! Cairo, our Bus driver was an amazing, passionate singer and gave us the ride of our life on the way home. We were encouraged to sing all the way and on the final round about did six circuits before he delivered us to our hotel. He explained it was a shift change time for the local police but it is my belief they are all his cousins.